The Unistik 2 lancing device is made by the Owen Mumford Company. This device is set up to use one time and then thrown away. It is used for infants to test their blood glucose. The testing is done on the heels of their feet. In order to avoid injury of their feet, the lancet is only pierced so much into that area. There is also a side-trigger component that prevents excessive pressure on the infant’s heel. This component, along with the needle, can protect those who administer the blood test from getting accidentally pricked. This single use lancet device has five versions. Each version has a different needle gauge and the skin penetrations vary for each one. All five versions use the same side-trigger component to avoid accidentally injury with the needle. Unistik 2 Comfort – The needle on this lancing device is thin and there’s not much penetration. Because of this, enough blood samples can be taken, especially is the skin is tender and extremely soft. This lancing device is used at home, or at a health care facility (diabetic clinic, geriatrics, pediatrics). 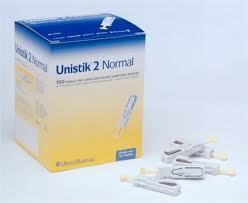 Unistik 2 Normal – This lancing device is used for people who have normal skin and it is also used in tests. It can also be used at home or at a health care facility (blood transfusion, adults, and geriatrics). Unistik 2 Extra – This lancing device provides more skin penetration. This one is used for people who have tough skin, various tests and expanded blood samples. It can also be used for blood transfusions. Unistik 2 Super – This lancing device is used for larger blood samples and various tests. This can also be used at health care facilities in the ICU/CCU departments. Unistik 2 Neonatal – This lancing device is used to test blood for sickle cell disease, and other blood disorders. Using the Unistik 2 lancing device is simple, but you have to follow the instructions provided as directed. The lancet cap goes into the Unistik 2 lancing device until you hear a click. Remove the lancet cap by twisting it. Once you notice the cap and the device are separated, continue to twist until the separation is complete. You must discard the cap and place it in a container. For adults, choose somewhere on your finger to do the pricking. If it’s an infant, choose an area on the heel. Press the device toward the targeted skin area and release the lancet by pressing the button. You may need to massage the affected area in order for the pricking of blood to be effective. To prevent extra pressure, do not squeeze the targeted skin area. After the pricking is complete, the needle immediately draws back. You are now Free to dispose of the needle. It should be disposed of very quickly and not left lying around somewhere. This is especially important if you have infants and small children in the area. They are notorious for getting into things, and messing with these devices is no exception. If you’re unsure of which one to use, check with your primary care physician to help you select the right one for you.